As a marketing writer, business writer and journalist for both print and online, Barbara Mannino knows what it’s like to be writing on deadline in the newsroom or adding finishing touches to get the brochure or direct mail piece out the door. It’s exhilarating stuff if you’re a writer — maybe not so much if you’re focused on your core business which has absolutely nothing to do with words. Barbara is a seasoned writer with a blended business and communications background. She has more than 25 years of experience as a journalist and as a marketing and corporate writer for Fortune 500 companies and consultancies. She is a regular contributor to Fox Business News where she covers careers, employee engagement, health care, lifestyle and budget, education and social media. Previously, Barbara wrote for an international news bureau with a beat in insurance and financial services, and also for a regional women’s magazine. Her corporate experience includes the copywriting of marketing and informational and promotional newsletters and customized pieces for internal and external audiences. Barbara has developed a reputation for doing her homework when preparing for interviews and for producing balanced articles and well-thought out collaterals. She has earned the respect of sources and clients, senior leadership and colleagues who sought her out as a “go to” person for communications deliverables. Barbara has earned several honors for excellence in communications and leadership, including awards from the Garden State Journalists Association; Pershing LLC, a BNY Mellon Company; the International Association of Business Communicators and the Life Insurance Communicators Association. At a time when news is expected to be communicated 24/7 and when in marketing content is king, good writing is the linchpin of any communications strategy. 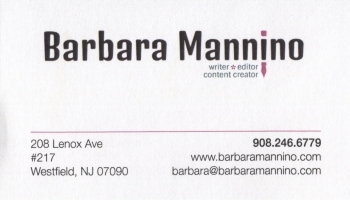 Whether you need a communications plan, writing services or both, call Barbara and have her tell your story.